With rain forecast, I dressed in waterproofs and winter boots and set off. After 200 yards I realised the car wasn’t running right and strange noises were coming from the back. Stopped to look and the nearside rear tyre was as flat as a Shrove Tuesday pancake. Phoned Benisant but he was already in East Cowes and his ST was in my wallet. Dumped car in the drive and took a taxi to the ferry. We boarded with 30 seconds to spare! I don’t recommend rushing about wearing waterproofs either. My efforts were rewarded with a fascinating match. West Ham are having a good season and lay 5 points ahead of us in 6th. Defeat would have made it very difficult for us to overhaul them as this fascinating season draws to its conclusion. Much was riding on this result. Ron reverted to 3 at the back with Cédric and Bertie as wingbacks. Clasie was alongside Victor and Pellè returned to lead the line with Mané and Long either side of him. West Ham again played Tomkins at right back suggesting Byram might not last 90 minutes. Song dropped back alongside Noble with Moses and Antonio out wide and Payet sat behind Valencia. Hammers wore their light blue away kit. By the time Saints kicked off towards the Chapel End, the rain had well and truly arrived. It blew into the stadium for the whole match but, in the enclosed bowl of St Mary's, the buffeting wind outside had little effect on the game. Hammers had brought a big away following who soon gave us a rendition of “Bubbles” whilst on the park their team were forced backwards by Saints quick start. In the 2nd minute pressure from Long forced the first corner. Bertie played the ball to Mane whose cross was headed out by Collins. Saints continued to press forward and during the early stages Clattenburg’s decisions looked even-handed. On 5m a forward pass just ran beyond Pellè and was fielded by Adrian. West Ham’s first attack resulted in a throw in. Antonio took it, the ball was played back to him, and the flag went up for offside. Then Pellè forced another corner which Clasie overhit and the ball was cleared. The first clear cut chance arrived on 8m when Mané found Long on the left. His deep cross to the back post found Cedric arriving at speed and Adrian dived smartly to turn the header away. A minute later Bertie forced another Saints corner. Clasie’s cross again cleared the box but Victor won the ball back. Quick passes between him, Fonte and Mané saw the latter find Victor breaking into the area. He stabbed the ball towards the oncoming Yoshida who tucked it past Adrian from close range. 1-0 Saints. Saints continued to enjoy good possession, especially the back three who were looking comfortable. On 11m Virgil, playing on the right, boomed a huge diagonal pass which was just too firm for Mané. Next Saints attacked down the right and Cédric found space to cross. Pellè rose but his header went high over the bar. On 15m Bertie burst passed Antonio but the winger tackled back and carried the ball away. Bertie chased him and he and Clasie were able to win it back. A minute later lovely inter-passing between Long and Pellè almost opened West Ham up, but Collins was able to win the ball. A minute later West Ham attacked down their right but the resulting shot was easily fielded by Fraser. When Noble fouled Bertie, Clasie had another chance to put a cross into West Ham’s area: there was plenty of pushing and shoving as the ball arrived and West Ham were awarded a free kick. The away side were beginning to see more of the ball and on 21m Payet lofted a long range effort onto the roof of Fraser’s net. Then Valencia chased a pass into the area shadowed by Maya. The forward tumbled dramatically in the box but Saints were awarded a goal kick. On 25m Mané was fouled wide left giving Bertie another free kick. His cross fell temptingly between Fonte and Pellè, but neither applied a telling touch allowing Adrian to fall on the ball. On 27m Antonio got past his marker and fired in a fierce cross that Saints were able to clear. A minute later Fraser was called into proper action. West Ham won a free kick on the left. Payet delivered it to the front post where Reid’s head sent it goalwards. The big keeper made a smart save to preserve Saints’ lead. The follow up was blocked for a corner. Payet took this too, but this time Saints broke smartly from defence with Mané. He found Pellè who curled a long cross just beyond the run of Shane Long. Although the game was more evenly balanced it was also becoming scrappier, with possession being turned over by both sides. On 35m West Ham won another corner on their left. Again Payet found the head of Reid, but this time the ball flew over the top. On 37m we saw the shape of things to come when Long was crudely brought down from behind – and the ref waved play on. West Ham were bossing possession now and Saints had to defend another Payet corner. When we broke out Clattenburg ignored another clear foul on Pellè. I noted that Victor was winning most of his battles with Song and Clasie was also working hard to stem the tide flowing towards our goal. On 45m a lovely Saints move was thwarted when Maya was penalised. A further break down field in the added minute before half-time also came to naught. HT 1-0. There were no changes at half time but as soon as West Ham kicked off Romeu and Austin began warming up in front of us. Play was held up briefly after a clash between Virgil and Valencia. Both were able to continue. Victor and Virgil were both defending well and Saints seemed capable of repelling most of what West Ham could muster. On 51m West Ham won a free kick leading to Valencia breaking into the box and shooting. Forster collected the ball. On 54m Victor lost the ball to Payet, chased him and dived in, missing ball, taking man. Another player or another ref would have produced a yellow, but this was Victor and Clattenburg so the card was red. Saints were down to 10 men. (Flamini was yellow carded for a far worse foul at Bournemouth on Sunday. Seems there is still one rule for them, another for the rest). Ron immediately replaced Mané with Romeu and Saints adopted a 5-2-2 “What we have we hold” formation. Virgil continued to defend heroically and on one occasion broke out of defence and carried the ball up-field. On 61m West Ham made 2 changes: Carroll for Moses looked planned but, at the same time, Tomkins limped off to be replaced by Byram. Saints were under persistent pressure, but now the home crowd started getting involved. OWTS rang round the stadium drowning out the away fans. As if on cue, Saints broke upfield and Long fired a curling shot that clipped the bar as it flew past. Indeed, Saints seemed comfortable defending and looked to break quickly whenever they could. On 65m Pellè was fouled and Bertie’s free kick was headed wide. On 67m Valencia saw yellow for fouling Romeu. Now it was Charlie and JWP warming up down the line. As 70m ticked by, Saints were penned in their own half but West Ham had still to produce any real threat. We still looked comfortable. Song was seeing a lot of the ball but his runs often ended in shots from distance that sailed into the crowd. On 72m Austin replaced Pellè. Then Emenike came on for Antonio. Two minutes later he met a cross into our box but headed wide – and the linesman had his flag up anyway. Carroll was getting little change from our defenders but on 76m a ball into our box cannoned off him but fell nicely for Fraser. On 78m Romeu found Charlie who forced a corner off Collins. Clasie’s cross was headed back to him but the second was claimed by Adrian. A minute later it was Fraser rising to claim a cross following a West Ham corner routine. On 80m another shot from Song sailed harmlessly wide (and I dared to write “plenty of pressure – no end product” in my notebook). Even Charlie Austin was dropping deep to help man the barricades and he cleverly drew a foul allowing Fraser to clear everyone downfield. Another long range shot sailed into the Chapel before Byram was caught offside chasing a long ball down the right. A minute later he was booked for a foul on Bertie – on TV it looked worse than Victor’s but Clattenburg makes every match a lottery. On 88 minutes Saints surged forward and Romeu hit a lovely reverse pass to Charlie who blasted it the wrong side of the post. Then another West Ham player hurled themselves to the ground to win a free kick. Valencia lined it up, ran up and fired high into the night sky causing much mirth in the Chapel. West Ham’s best chance of an equaliser came in the final minute when Cédric sliced a clearance dangerously near to his own goal, but Fraser was glad to see it go out. The 5 added minutes seemed like ages. 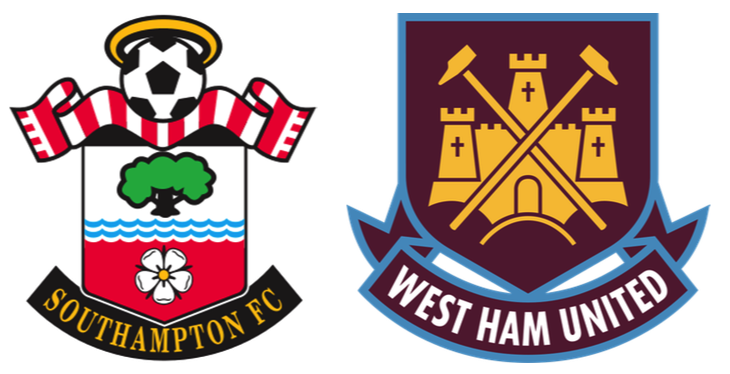 West Ham piled forward but Saints stayed strong. JWP replaced Clasie and the red and white wall was never breached. Both Long and Austin were back booting the ball downfield. It was very exciting. Fraser eventually fell on the ball and stayed there as long as he dare. After an age the whistle blew and we had held on. A 1-0 win maybe but how enjoyable was that? I was glad of the waterproofs on the way home.